I like the white dress shirt and black concert shirt dichotomy. I don’t often wear concert shirts underneath my dress shirts, if only because of how some show through more obviously than others, so I’ve always kept them separate. 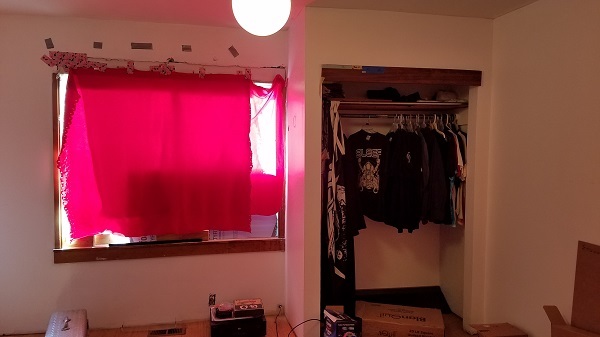 During my year in this 2-bedroom apartment, I’ll keep the concert shirts in the “warehouse” room where I’ll store, manage, and downsize a majority of my possessions, and I’ll keep the professional clothing in my bedroom along with my more prized possessions. When the lease is up, I’ll downsize to a cheaper location or one closer to the city, so I’ll need to take a year’s worth of critical passes over these 79-some concert shirts. I have a few that I’ll never wear. Not because I don’t like them, but because the prints are either fading or will fade after one or two washes. They’re essentially like art posters printed to shirt. I still like them, but there will come a time fairly soon where I’ll need to decide if I want to start wearing them or if I should start selling them off. It will be a tough decision but one which should help me downsize even further. Now, I’m not a fan of owning fragile objects. I own two varieties of white dress shirts: the “interview” ones I’ll seldom wear and the cheap daily ones. I bought ten of the dailies for $3 each, and over the past year, I’ve never encountered a coffee stain or patch of dust or dirt that hasn’t washed out easily. 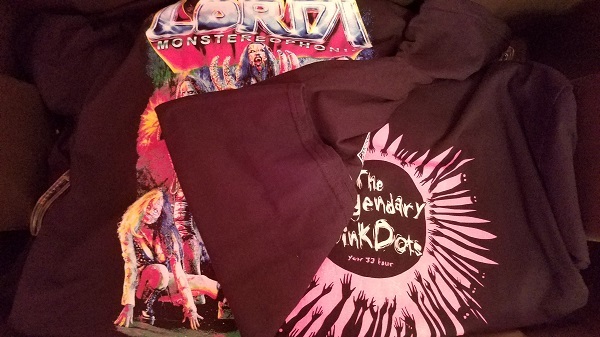 My joke has always been that once one of these shirts becomes unprofessionally worn out, I’ll wear it to a GWAR concert, let the dyes sink in, wash it, and wear it along with my GWAR concert shirts, or something. I don’t like wearing something twice before it disintegrates. I’ve already donated half of my wardrobe. I got rid of all the poor quality, extra large polo shirts first, then the higher quality polo shirts and some used dress shirts I gave to a friend of mine. 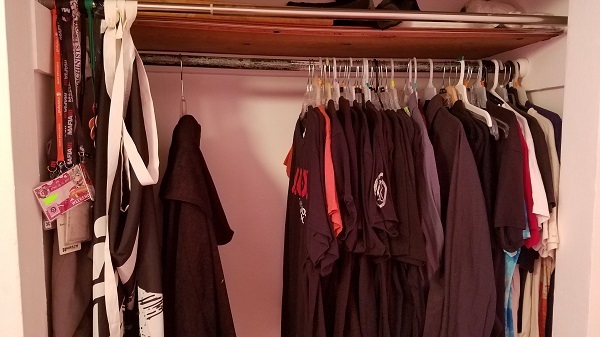 I donated all of my plain t-shirts and a substantial amount of my graphic t-shirts that had logos or designs of things I don’t care much about. All that’s left are some favorite graphic t-shirts, the concert shirts, the dress shirts, and for that, I feel freer. I’m not burdened by drawers and shelves of things I’ll never wear. Now I just need to get rid of anything I don’t wear frequently or during special occasions. Maybe I’ll cut another third by 2020? Inspirations: I had this essay title since December, I think when I first started donating more than my XXL shirts. 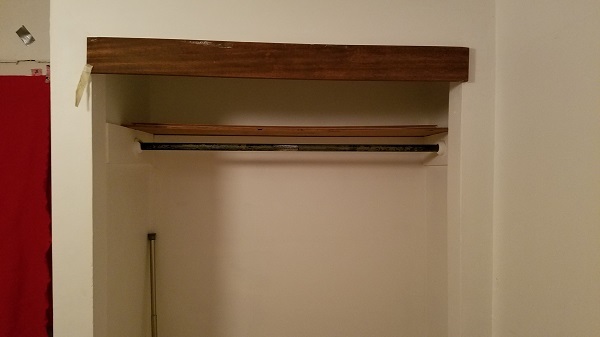 Within the next day or two, I’ll be taking down all my concert shirts from my old place and moving them into the new apartment. I might use that time to mentally sort out what I can get rid of, but I won’t do anything until after I’ve fully moved. Photos: I’ll have to hunt down my full gallery, which I had to cobble together because of how quickly I was running out of storage space on my phone, but these shots give an idea of the amount of time and effort I needed to deal with this collection. Ugh.